I wanted to share with you a quick post of a makeover I did several months ago. I keep posts like this handy when I'm busy and don't have time to write a post. My client was actually someone I made over for the charity event the Help Portrait. My client was wearing red, black and white and she wanted to wear it on her eyes! I wanted to compromise but I knew that the combo who probably be overwhelming to her. To see what I ended up doing, click here! As mentioned, the client really wanted to match her clothes. She wanted gray, white, black and red on her eyes and bright red lips. While you want to please your client, you want to make sure that you exert your opinion as a professional. Instead of doing the black, red, gray and white eyeshadow combo...I ended up with subtle gray eyes and a red lip. 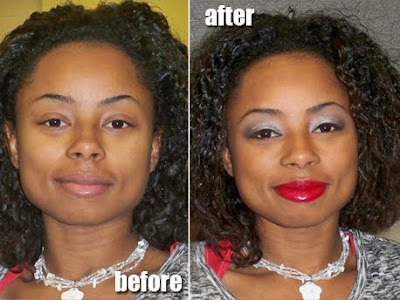 The client didn't wear a lot of makeup, so I knew her request would probably overwhelm her. Here's a tip: most people who aren't used to wearing red lips get a bit freaked out once it's on. I swatched the lip colors for my client and she still went for the brightest shade. Once applied, she hated it. To fix the situation, I recommend topping the look with gloss. It makes a red lip a lot more wearable. Also, take a darker lip pencil and fill in the outer edges. The client was definitely strong willed about what she wanted. She was adamant against liquid or cream foundation because I think she had the impression that it would turn out like a mask. Since she had pretty good skin, I compromised with my Graftobian HD Pro Powder that can be used as a foundation. Since this was a charity project, I donated my services for free. It's great to give back to the community when you can. Not going to lie though, this was probably one of my most difficult gigs ever! You're going to run into a lot of different personalities out there. Some people will like your work and some won't. The key is to stay confident and work with your client until you reach a compromise. you did a great job! she looked amazing! thanks for sharing your experience. Cure for Dry, Itchy Skin!